Former National Security Adviser Michael Flynn, right makes a court appearance at U.S. District Court for the District of Columbia on Tuesday. White House senior adviser Jared Kushner, center, and his attorney Abbe Lowell, right, depart Capitol Hill in Washington, Monday, July 24, 2017, after a closed-door interview with Senate Intelligence Committee investigators looking into Russia's election meddling and possible ties to the Trump Administration. Michael Flynn, former national security advisor to President Donald Trump, arrives for his plea hearing at the Prettyman Federal Courthouse Dec. 1, 2017 in Washington, DC. 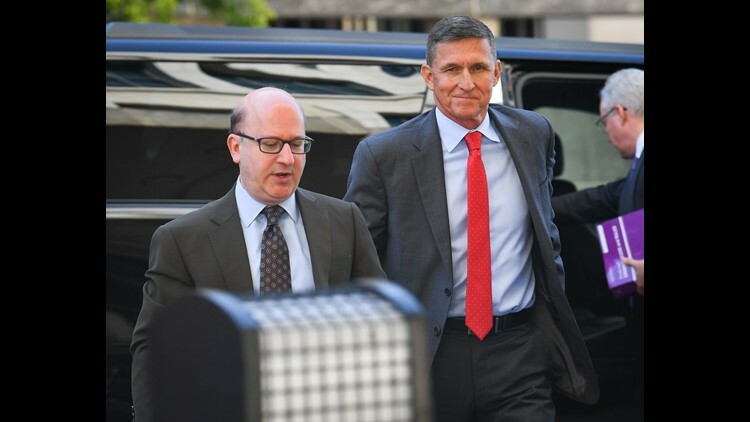 Former National Security Advisor Michael Flynn (R) arrives at the at the E. Barrett Prettyman Federal Courthouse in Washington, DC, Dec. 2017. Others are not identified. Flynn is expected to plead guilty to lying to the FBI on two conversations with the Russian ambassador during the presidential transition in 2016. President Trump speaks on the phone with Russian President Vladimir Putin in the Oval Office of the White House on Jan. 28, 2017, along with Vice President Pence and Chief of Staff Reince Priebus, Chief Strategist Steve Bannon, Press Secretary Sean Spicer and National Security Advisor Michael Flynn. In the first seven months of his administration, Trump has seen the departures of many senior aides including Priebus, Bannon, Spicer and Flynn. On Aug. 18, 2017, Steve Bannon left his post as senior adviser to President Trump. Seen here, Bannon helps with last minute preparations before President Trump announced his decision to pull out of the Paris climate agreement at the White House on June 1, 2017. On July 21, Sean Spicer quit his job as White House press secretary Friday after President Trump decided to tap Anthony Scaramucci as the White House communications director, according to two White House officials. Seen here, Spicer takes a question during the daily news conference at the White House on Feb. 14, 2017. Walter Shaub resigned his post as director of the United States Office of Government Ethics on July 6, 2017. Ahaub, who prodded President Donald TrumpÕs administration over conflicts of interest resigned to take a new job, at the Campaign Legal Center, a nonprofit in Washington that mostly focuses on violations of campaign finance law. Mike Dubke (r) on May 30, 2017, confirmed his resignation as White House communications director. Counselor to the US President Kellyanne Conway (L) and Director of Communications for the Office of Public Liaison Omarosa Manigault (2-L) and White House communications director Mike Dubke (R) listen as a reporter asks a question during a joint press conference in the East Room of the White House in Washington,on April 20, 2017. On May 5, 2017, the White House fired White House chief usher Angella Reid, the person responsible for managing the residence and staff its and overseeing events. No reason was given for Reid's dismissal. In this Oct. 18, 2011 photo, the then-incoming White House chief usher Angella Reid is photographed in Lafayette Park across from the White House in Washington. Deputy National Security Advisor, K.T. McFarland speaks during during an event celebrating Women's History Month, in the East Room at the White House March 29, 2017, in Washington, DC. On April 9, 2017, McFarland was asked to step down and serve instead as ambassador to Singapore. Katie Walsh left her job as White House deputy chief of staff less than three months into the the Trump administration on March 30, 2017, for a private sector role. In this Nov. 14, 2016, file photo, Katie Walsh appears at a post-election press briefing to discuss the RNC's role in the election, at the Capitol Hill Club in Washington. On Feb. 14 2017, Michael Flynn abruptly resigned from his position as National Security Advisor after facing increased scrutiny due to reports that the Justice Department contacted the White House in regards to Flynn's alleged pre-inauguration conversations with the Russian ambassador concerning sanctions. This Jan. 22, 2017, shows Flynn arriving to a swearing in ceremony of White House senior staff in the East Room of the White House in Washington.